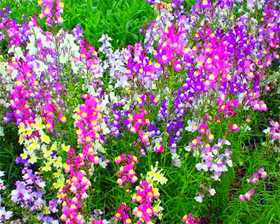 A highly original bedding plant, the Linaria is low-growing and has attractive grey-green foliage. This is flanked, through the summer months, by a myriad of flowers in a wealth of bright and striking shades. Sow February to April. Germinate at 20-30C on the surface of a good free draining, damp seed compost. Place in a propagator or seal container inside a polythene bag until germination which usually takes 5-21 days.